I thought today would be the perfect time to try a “shot,” as I had a marathon shoot to produce which featured a 4:30 a.m. wake-up call in order to capture three Internet videos for a corporate client by 4:30 p.m. I cannot drink regular coffee before 7 a.m. as it does a number on my stomach. 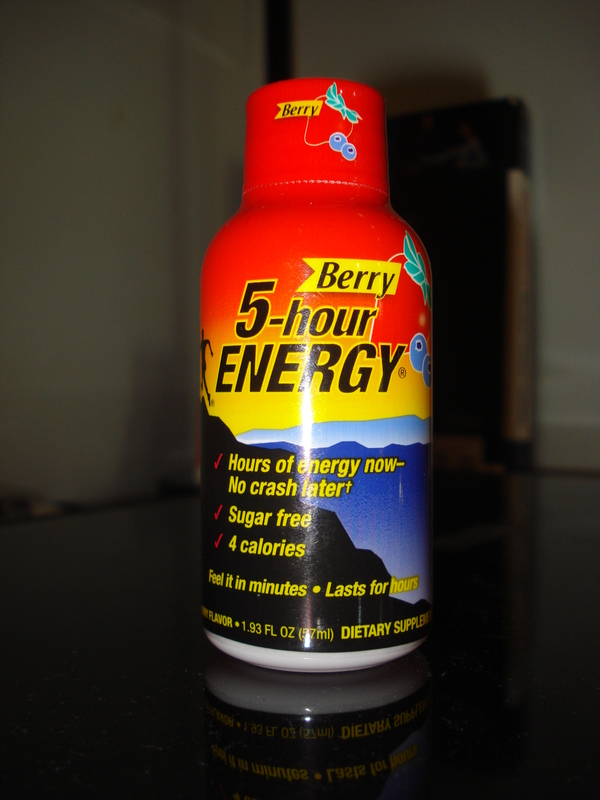 So, I had an iced decaf around 6:30 am and decided to try the “5-Hour Energy” shot for a boost in the afternoon. It was the first and last time I’ll ever use the drink to get my energy up. Please know, all my comments are based solely on my personal experience with this popular energy drink. Some of you reading this post may be big fans and never experienced the following effects: within 30 minutes of drinking all 1.93 fluid ounces of the berry-flavored shot, my head started pounding and I had palpitations. I was definitely awake, but for me, the headache and flutters in my chest were not what I expected or hoped to experience. I realize I was under some extra stress and pressure because of my demanding day, but turning to a cup of green tea of second 16-ounce iced coffee after lunch never caused me to feel like I did this afternoon. In the end, I wish I had simply relied on one of my regular “energy boosters” instead of the shot. Again, I realize there are many people out there who use these drinks to get through a long day or even rev up before a workout. I thought this was simply a good opportunity to share my own personal experience in the hopes of raising awareness that even over-the-counter products and supplements can cause unwanted or unexpected results. One positive note: I definitely didn’t experience any kind of “crash” after the five-hours were up. I simply got tired again when the long workday came to an end. Now, I look forward to getting some solid sleep and starting a new day filled with new opportunities to have fun, be fit and feel fabulous! Posted on August 31, 2011, in Fitness, Health, Nutrition and tagged Caffeine, Energy Drinks, Laura DeAngelis, Over-the-Counter Products, Personal Fitness. Bookmark the permalink. 6 Comments. Good morning, Amy. Glad I’m not the only one with a not-so-great “reaction” to this popular drink. You bring up an excellent point about the possible effect these products can have on kids. You also bring up another important topic: getting enough sleep! (I see a future blog post on that one.) That is something we all could use more of, or at least I know I certainly could! All is well here after the storm. Thanks for the concern! Wow — what a terrible experience! Well..you tried! Maybe we should work on a list of natural energy boosters…. Hello Paula, I like that list idea! I know exercise will be on there for certain. I’m on it! I’ve never tried the 5 hour drink myself. And now after reading your insightful post I will not be trying it! Sounds scary with the heart palpitations and all.